As a resident of Connecticut who was directly affected by the Sandy Hook School shooting I find it hard to believe that anyone would deny this horrible event happened. To allow a professor, who represents your university, to continually harass family members who lost loved ones that day is not only an embarrassment to your school but bordering on criminal behavior. While I support free speech, his consistent contact with both the Pozner family and Soto family is disturbing and by any legal definition would be called stalking. Is this really how you want the outside world to view members of your university staff? Fitch includes a link to the defamatory opinion piece attributed to “the parents of Noah Pozner” that left FAU administrators scrambling in search of a pretext to get rid of Tracy. Coltman’s repeated attempts to contact Fitch for additional information were apparently unsuccessful. In the above email communication with Coltman, Fitch makes no mention of the fact that she is employed by a law enforcement agency. Rather, with no evidence, she seeks to reinforce the false and defamatory op-ed by convincing the FAU Dean that Tracy was likely guilty of criminal stalking, harassment, and overall extracurricular misconduct that warranted his firing. Instead of contacting Tracy to request an explanation of the allegations Coltman was evidently so persuaded by the whole affair, including Fitch’s email, that she instead reached out to Fitch for additional information. While there is more than one “Misty Fitch” in the US, this party’s email identification, “wpdanalyst,” confirms that she was employed by and working for Connecticut police intelligence while reaching out to Coltman. 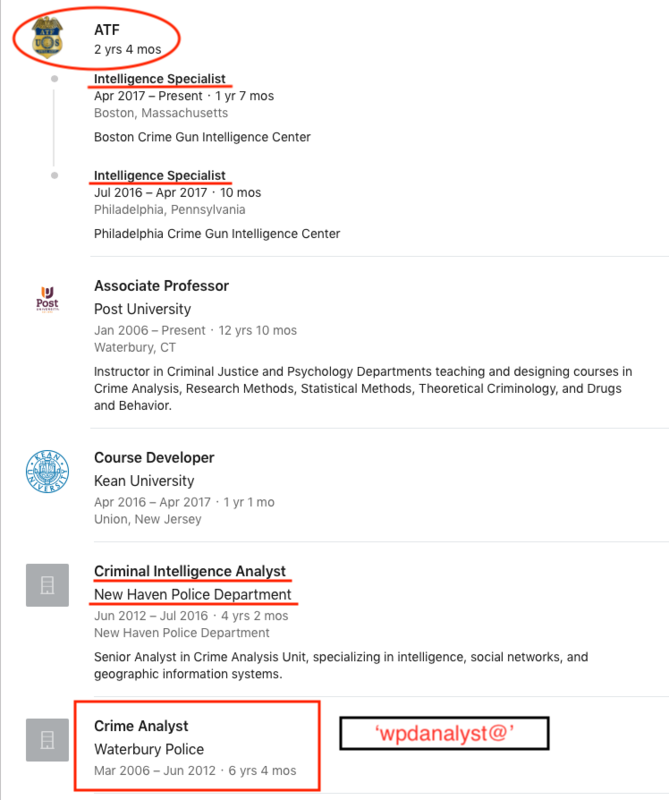 Fitch’s LinkedIn profile shows her employment “Crime Analyst” in the Waterbury Connecticut Police Department (“WPD”) between March 2006 and June 2012, at which time she joined the New Haven Police Criminal Intelligence Unit. Fitch joined the Bureau of Alcohol, Tobacco and Firearms in 2016. 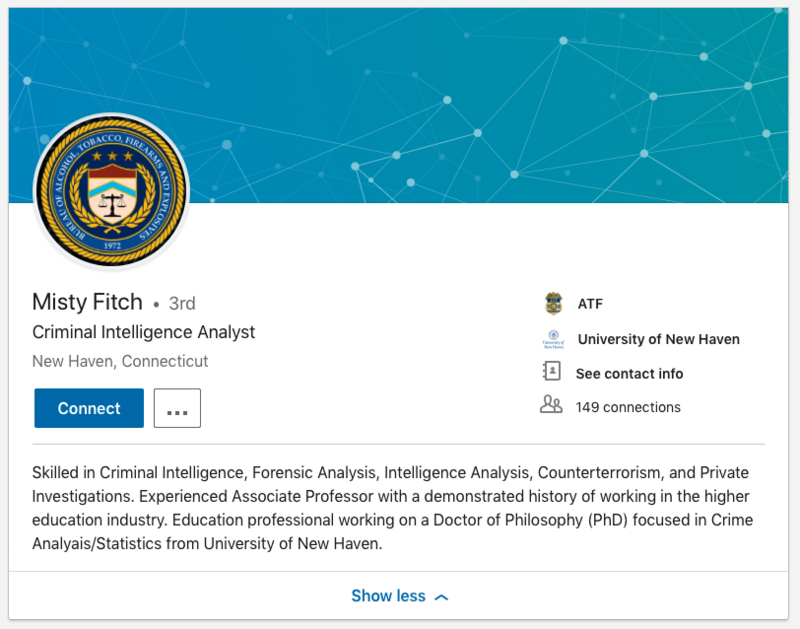 According to her LinkedIn profile and a press release from the US Attorney’s Office in Connecticut Fitch appears to work for the ATF out of the New Haven Police Department. It is not clear how long she has been affiliated with the ATF. Fitch’s LinkedIn profile also indicates that she is employed by Post University, a for-profit online institution, as an “Associate Professor,” with a “demonstrated history of working in the higher education industry,” Given this background she may have been tasked by her superiors to reach out to FAU. 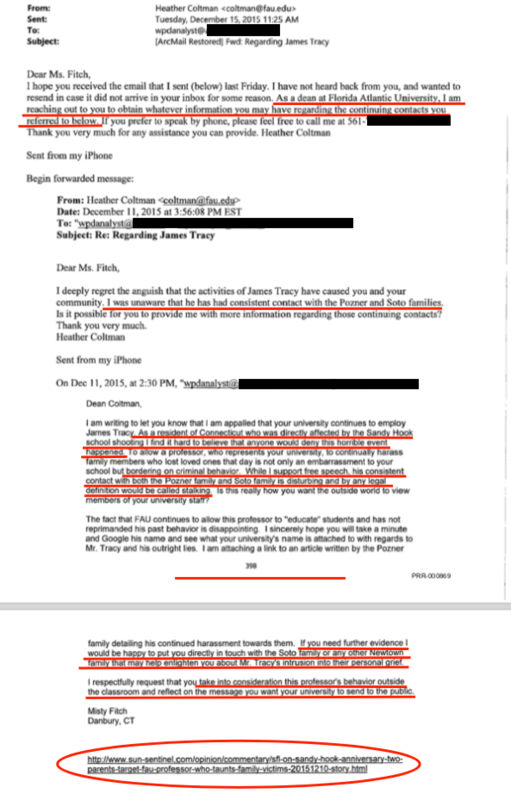 Further, given Fitch’s federal ties and intelligence background it is not unreasonable to suggest that she may have been aware of Tracy’s 2015 dispute with FAU’s unconstitutional “Outside Activities Policy.” FAU administrators employed the policy as a pretext to fire Tracy. A Connecticut-based law enforcement agent, Fitch appears to have misrepresented herself as a lay member of the public in an effort to hasten FAU’s termination of Tracy’s employment. In light of her law and criminal intelligence expertise (and self-avowed knowledge of the Sandy Hook event) it looks as if Fitch appears knowingly lied to Coltman by attempting to convince her that Tracy was guilty of criminal harassment, when the facts clearly dictated otherwise. Fitch also concludes her email to Coltman with “Danbury CT,” a community in relatively close proximity to Newtown, giving the impression of colloquialness and in contrast to her real-life credentials. 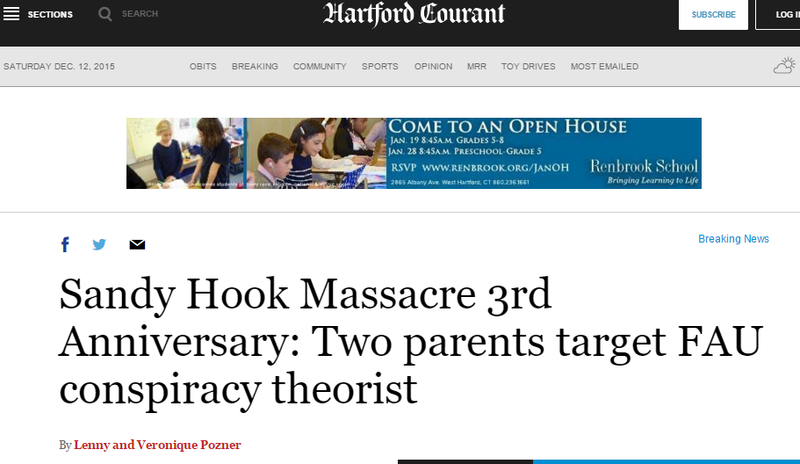 Fitch promises that she can put Coltman in direct communication with “the Soto family or any other Newtown family” presumably involved in Sandy Hook, thus revealing an ongoing relationship with the individuals that collectively generated tens of millions and built careers in the non-profit sector as a result of the event. 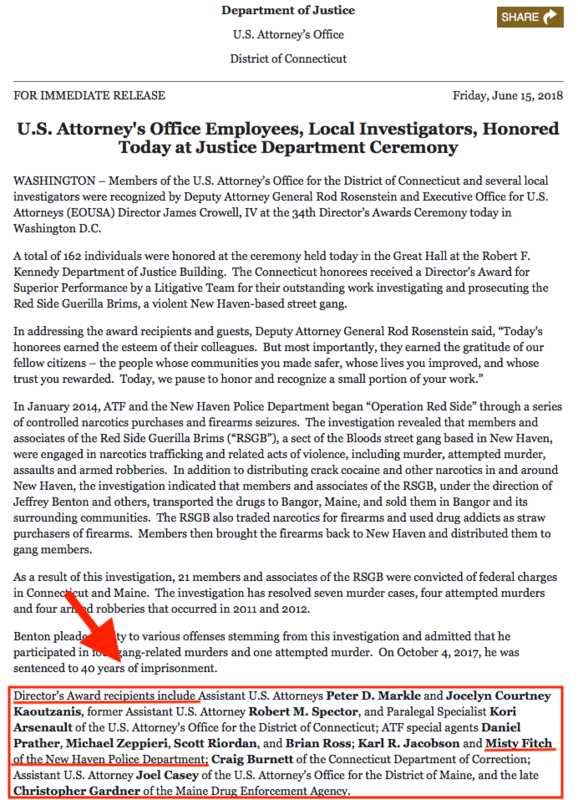 The above clearly suggests that Fitch was intentionally seeking to give the false impression that she is merely a Connecticut resident rather than a police intelligence officer. She is doing this while declaring a close association with and effectively acting as the Sandy Hook families’ liaison. contend that in a country plagued by gun violence, a central registry could help keep firearms out of the hands of criminals and allow law enforcement officials to act more effectively to prevent gun crime. Fitch’s email was but one in a flurry of communications directed to FAU in December 2015 in the wake of the Pozner’s false claims. In light of the above one is left to ponder how many of those communications were genuine and how many were scripted and feigned outrage to fulfill professional assignments. Further, since Fitch expressed her close relationship with the Pozner and Soto families, are those families (or individuals claiming to comprise them) working with state and/or federal law enforcement? What seems clear at this point is that Fitch’s law enforcement background combined with her misleading non-disclosure tactics and manipulation of FAU administrators’ emotions contributed to the overwhelming success of what might be termed “Operation Terminate Tracy”–an exercise that endures three years later with the aid of FAU and the State of Florida. As we have repeatedly declared, Tracy never stalked or harassed any Sandy Hook residents. Rather, he sent Pozner’s “HONR Network” organization a certified letter requesting evidence to substantiate a copyright infringement claim that Pozner had erroneously filed against MemoryHoleBlog. There was no contact with the “Pozner family,” much less the family of “Victoria Soto.” These are libelous and wholly unfounded allegations. The U.S. Government was then and still is now, under Israel Lover Liar Trump, a pathological liar to its citizens. This is why they are now fostering secrecy and censorship. A government big enough to give, is also big enough to take away or punish one who is “uncooperative”. Winfield J. Abbe, A.B., Physics UC Berkeley, 1961, Ph.D., Physics, UC Riverside,l 1966.